Share your passion for your cause with the White Ribbon Poster. With 27 lines for text on this template, you can include all your event details. 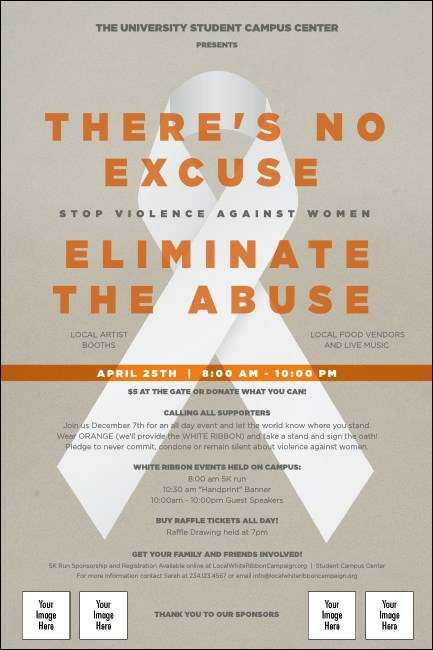 Features a soft grey background with dark grey and orange lettering, and a strong white ribbon to represent the importance of ending violence against women. Combine with a White Ribbon Event Kit for your campaign materials. Browse the online gallery at TicketPrinting.com for all of your special events.